Obesity is one symptom of several, which together constitute what is now termed metabolic syndrome. Morbid obesity is also associated with a host of other symptoms including high blood sugar, high blood lipids, insulin resistance and liver disorders. The root causes of which are traced back to excessive food consumption, reduced physical activity and in some cases, genetic predisposition. I have written before on the connection found between gut microbe populations and metabolic syndrome. Namely, there is a clear shift in the gut microbial population between obese and lean humans and mice. Obese mice have different microbes in their guts than lean mice. Obese humans have different gut microbes that lean (or even dieting) humans. There is a strong connection between what we eat, how much we eat,and the species of bacteria that inhabit our gut. Peter Turnbaugh and colleagues have noticed that the bacteria in the gut of obese mice process carbohydrates better. Thus, obese mice get a bigger “bang for the chow” ingesting calories from food that, in lean mice, would normally go unprocessed. A vicious cycle which makes the fat grow fatter. A study by Matam Vijay-Kumar and colleagues shows that the situation is somewhat more complex. Our gut ecosystem is indeed shaped but what we eat, but also by our immune system. Gut bacteria are under constant selective and adaptive pressure from the immune system, which basically keeps them in check. The innate immune system is that part of the immune system that offers a short-term defense against invaders. This is opposed to the adaptive immune system which provides a loner-term defense. The adaptive system is the one that “remembers” pathogens, either through vaccines or actual infections. The innate system is the first and immediate line of defense, but it does not have a long-term memory. Vijay-Kumar and colleagues asked the following question: what happens if we remove the innate immune system from the equation? How does that affect gut microbiota and obesity? 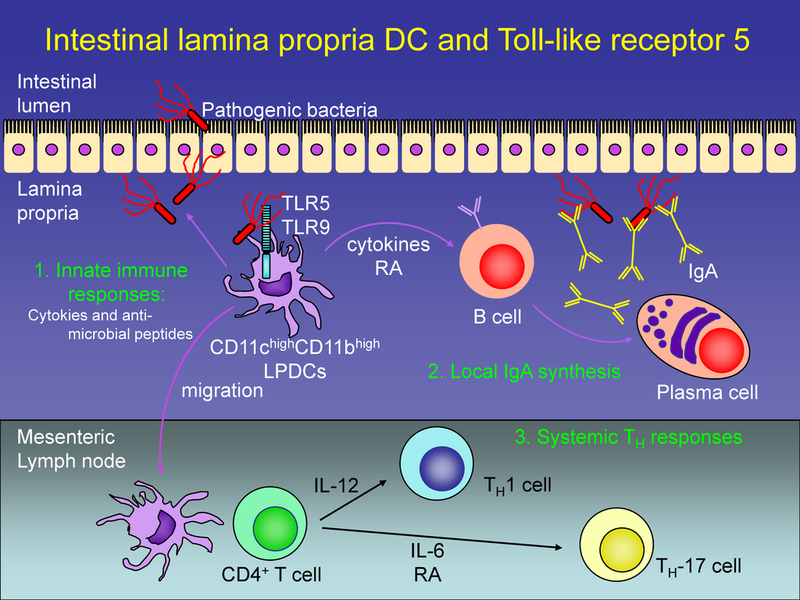 One important component of the innate immune system in the gut are Toll-like receptors. Toll like receptor 5 or TLR5 is a gut wall sensor for bacterial flagella, which is acting on the side of the gut wall that is facing away from the gut lumen. TLR5 acts like an electronic fence: if it senses flagella, this means there are motile bacteria which have breached the perimeter (gut wall), and they are probably up to no good. TLR5 then activates the immune system, which attacks the invading bacteria. What Vijay-kumar and colleagues have shown is that a strain of mice lacking TLR5 receptors (T5KO or T5 knockout mice) were plagued by a host of problems including metabolic syndrome. 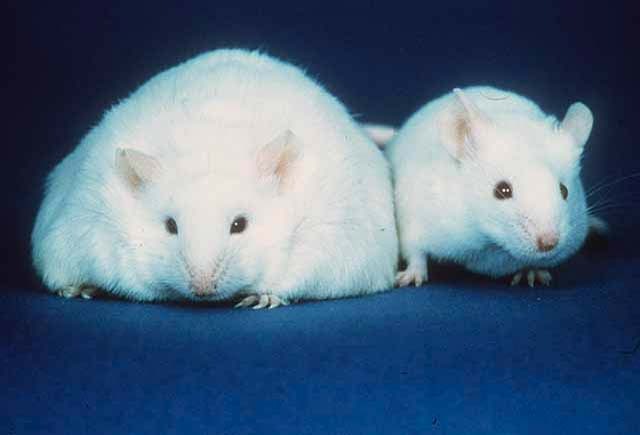 The mice were fatter and had higher blood sugar and blood lipid levels than the control mice. When fed a high-fat diet, both T5KO and control mice acquired metabolic syndrome, but the T5KO mice fared much worse: they became diabetic, accumulated an abnormal amount of liver fat, and have shown pancreatic islet inflammation, which is an indication that insulin production was overloaded to the point of breaking down. They decided to examine whether the loss of TLR5 is responsible for change in bacterial species, and, as a result, those different bacteria cause metabolic syndrome. When they treated T5KO mice with antibiotics which killed 90% of their gut bacteria, the mice’s symptoms improved. At the same time, when the researchers transferred the feces of T5KO bacteria to the gut of normal germ-free mice, the germ-free mice started showing metabolic syndrome, even though they had a normal immune system. Finally, they have shown, using a metagenomic analysis, that the composition of species in the T5KO mice and the control mice were different. The researchers concluded that, yes, it is the bacteria which are the ultimate cause for the metabolic syndrome. However, the immune system has an important role: it keeps the microbial population in check and shapes the species composition. This is interesting, since we are accustomed to think that the role of the immune system is protecting us from infection. However, it seems that the immune system, by controlling the types of bacteria inhabiting our gut, plays a role in metabolism as well. It’s a very exciting concept, and understanding it requires a shift in the way we think about our immune system and our gut flora. We need to think of the sum total of our gut flora as an organ by its own right. This organ inputs the food we ingest, it outputs metabolic products. Additionally, the “gut flora organ” outputs microbes some of which may be pathogenic. To a large extent, the immune system controls the “tissue makeup” of this organ: which bacteria populate our gut flora. This population control does not only keep the pathogens in check, but also affects how the “flora organ” function as a calorie supplier. That rather nebulous “genetic predisposition” component of metabolic syndrome does include the immune system. We already know of the role of the immune system in another cause of metabolic syndrome, that of latent autoimmune diabetes, an autoimmune disease that destroys the insulin producing cells. Here, however is a new concept: the regulation of our pathogens by the immune system can also regulate our metabolic health. Tagged with: gut bacteria, gut flora, immune system, metabolic syndrome, metagenomics, obesity. So, is there any practical application here? Can gut bacteria be taken by obese people to change the makeup in the gut? The probiotic people have been saying that for years. I’m not knowledgeable enough to answer this with a qualified anything. Note that the link btween bacteria and obesity has been made some time ago. The novelty of this research is that the innate immune system is now thrown in the mix.